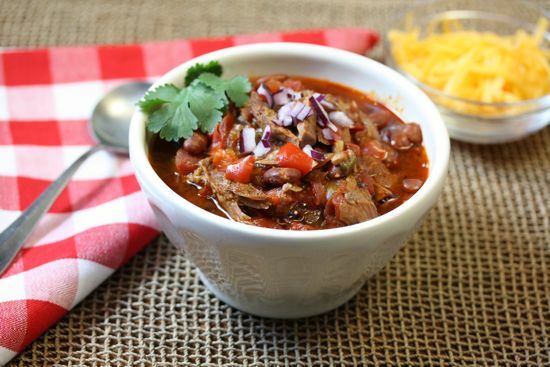 Whether you’ve been hiking in the woods or just sprawled on the couch watching the big game, a hot bowl of chili is always welcome on a crisp winter day. If it’s spent all day bubbling away in a slow cooker while you were playing, all the better. In preparation for Super Bowl Sunday, I’ve been working on a slow cooker chili recipe for the last couple of weeks. We’ve eaten more chili than I would recommend, but the end result is a deeply flavorful stew of home-cooked beans, lively spice and savory turkey. It’s hearty enough to satisfy the most devoted chili head, yet still low in fat if you don’t pile on the condiments. I realize there are plenty of chili recipes in circulation already that can be thrown together and left to simmer for hours in a slow cooker. Most are pretty basic, though, and I wanted a chili that tasted like I had tended it all day. To pump up the flavor, I use pure ground chile, cumin, coriander, Mexican oregano and a pinch of cinnamon along with a touch of cocoa at the end. Inexpensive turkey legs and thighs take the place of the usual ground meat. Beans add nutrition, fiber and lovely background for the vibrant spices. Although you could use canned beans instead, I don’t like their spongy texture or salty flavor. I cook my own the day before and freeze the leftovers for a later meal. Since the chili must cook for 8-10 hours, you may want to assemble the ingredients in the crock insert the night before and chill the whole thing in the fridge. The next morning, pop it in the cooker and turn it on. The chili will only take about half an hour longer to cook and you’ll be free for the day. Although I find the slow cooker useful, I don’t use it all the time. So I had a couple of things to learn during the course of developing this recipe. Number one: Don’t expect a 4-quart cooker to brew up a big batch of chili. By the time I had added all the ingredients I thought I needed for this recipe, my old cooker was almost overflowing and the turkey took far longer than expected to cook through. If I had read the instruction book, I would have known you shouldn’t fill the crock more than 3/4 full. I went shopping for a new cooker. The one I bought, the 6 1/2-quart Crock Pot Touch Screen model, received top marks from Cook’s Illustrated and I was impressed with how much better it performed. The temperature stayed steady at about 200 degrees once the cooker brought the chili up to “low.” Although it’s significantly more expensive than many cookers on the market, I liked the fact that you can program it to cook for up to 20 hours on high. When the cooking time is up, it automatically shifts to the warm setting for up to six hours. Number two: Watch your liquids. 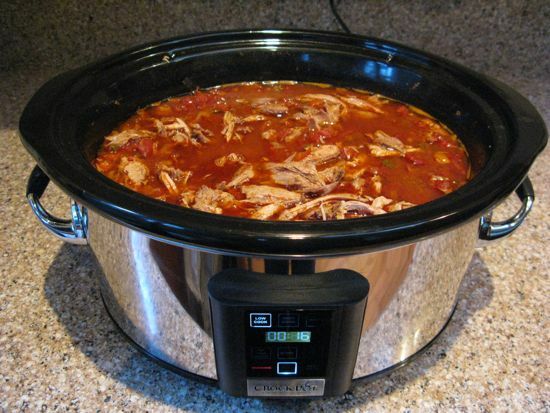 Because a slow cooker is a closed environment, liquid does not evaporate during the course of cooking. In fact, more liquid is drawn out of the vegetables and meats. That makes a tasty broth, but not if you’ve added too much liquid in the first place. My second batch was watery and dull because I didn’t drain the beans or tomatoes at the beginning. The third try was the charm. This chili was thick and meaty, sweet with tomatoes and ripe peppers and spiced with enough ground chile to tickle the tongue without searing the palate. Add more chile if you crave heat. Rinse turkey legs and thighs with cool water, pat dry with paper towels and sprinkle with salt and pepper. Warm 2 tablespoons olive oil over medium heat in a large skillet and sautÃ© turkey parts until brown on all sides. Remove turkey from pan, draining excess fat, and set aside. In the same skillet, add 1 tablespoon olive oil and sautÃ© onions, garlic, bell peppers, jalapeÃ±o and celery until soft, 3-5 minutes. Place drained beans in slow cooker. Add vegetables, stir in chile powders, cumin, oregano, ground coriander, paprika, cayenne and cinnamon. Lay turkey parts atop the beans, sautÃ©ed vegetables and spices. Pour drained tomatoes over all and sprinkle with 1½ teaspoons salt. Cover and cook on low for 8-10 hours. Half an hour before the cooking time has elapsed, stir in the corn meal, which thickens the chili a little and adds body. When turkey is cooked through and ready to fall off the bone, remove from slow cooker and discard skin and bones. Shred the meat and return to the cooker. Sprinkle in cocoa, stir and check for seasonings. Add more salt if necessary and crushed red pepper flakes to taste. Serve in soup bowls, passing around the cheese, cilantro, onion, avocado and sour cream for diners to add as desired. Cover beans in cold water by about 2 inches and let soak overnight. (Or use quick soak method and place the beans and water in a saucepan, bring to a boil for two minutes, cover, remove from heat and let stand 1 hour.) Drain beans and place in medium or large slow cooker. Add onion, garlic and chicken broth. Cover and cook on high until beans are just tender, about 3 hours. They should still be a little firm since they cook with the chili, too. Beans may be cooked ahead and refrigerated overnight before chili is assembled. Any excess may be frozen. Just the thing for our coming ice storm, I can hear our branches cracking already. I’ve been looking for a good chile recipe and this one looks tasty. Perfect for this frigid weather. Thank You.